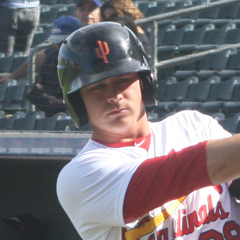 Three St. Louis Cardinals appeared in Surprise’s Saturday AFL loss to Peoria. Andy Young singled in four at-bats. Connor Jones pitched 1 1/3 innings of scoreless relief and Will Latcham added a scoreless ninth. Results for the game played on Saturday, November 10. One St. Louis Cardinals position player and two pitchers appeared in the Saguaros’ loss to Peoria on Saturday. Andy Young hit ninth for Surprise. In his first at bat in the second inning, Young struck out swinging. The second baseman grounded out to third in the fourth inning, struck out swinging in the sixth, and singled to left in the eighth. Connor Jones pitched 1 1/3 innings out of the bullpen, allowing one hit and fanning two. 13 of his 22 offerings were called strikes. Will Latcham closed out the game by pitching a scoreless ninth, with one hit allowed and one strikeout. 12 of his 17 pitches went for strikes. No other Cardinals saw action. The Saguaros are 10-16 in the AFL West and have been eliminated from Championship contention. Sunday’s game: No game scheduled. Follow Marilyn Green on Twitter @Marilyncolor.